Marge Marchand proudly displays the new Rangers Heritage jersey she purchased for her son, Nick, at the NHL Store. Marchand was the first person to purchase the new Blueshirt following its unveiling. For Marge Marchand, being first on line to purchase the Rangers brand-new Heritage jersey at the NHL Store on Friday night in midtown Manhattan had nothing to do with collecting a new piece of trendy sports clothing. Instead, like so many Rangers fans, it had everything to do with family. Marchand was there to purchase the handsome dark blue sweater that celebrates the Rangers’ 85th anniversary for her 30 year-old son, a die-hard Blueshirts fan who currently resides in Vermont. She was also there for her husband, a passionate life-long member of the Blueshirts Faithful who passed away 12 years ago from cancer. At the request of Nick, Marchand made the trip in from Coram on Long Island to purchase a heritage sweater with Marian Gaborik’s name and No. 10 stitched on it. She arrived on line at the NHL Store shortly before 6 p.m., more than a full hour before the doors would open and the brand-new jerseys would be available for purchase. Marchand could not have imagined beforehand that she would be the first to actually buy the new Rangers sweater. The Heritage jerseys were unveiled in a special ceremony which took place at Rockefeller Center earlier on Friday night. Ten former Rangers joined 11 members of the current squad in a celebration of the rich history of the franchise. Fans rimmed the upper area of the famed Rockefeller Center ice rink as emcee Al Trautwig held question-and-answer sessions with both alumni and current Rangers down on the ice itself. After the ceremony, the fans took part in a free skating session with many members of the Rangers family. One of the fun aspects of the event was seeing the alumni wear their actual game-used sweaters. Alumni attending the ceremony were Rod Gilbert, Brian Leetch, Adam Graves, Ed Giacomin, Vic Hadfield, Ron Duguay, Dave Maloney, Gilles Villemure, Nick Fotiu, and Pete Stemkowski. 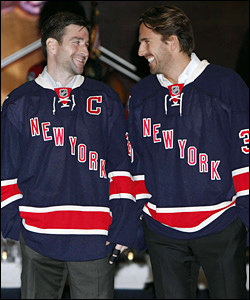 Representing the 2010-11 Rangers were team captain Chris Drury, goaltender Henrik Lundqvist, forwards Marian Gaborik, Brandon Dubinsky, Sean Avery, Brian Boyle, Brandon Prust, and Derek Stepan, and defensemen Michael Del Zotto, Michael Sauer, and Matt Gilroy. Lundqvist, Avery, Boyle, Gaborik, Del Zotto, and Gilroy took part in the question-and-answer session with Trautwig and Maloney, who also served as co-host. And they did so while wearing their traditional home blue jerseys. When next the current players were seen by the fans they were walking out to the center of the ice, led by Drury, wearing the Heritage jerseys in public for the first time. Marge Marchand knows that those are all important ingredients of what makes up the New York Rangers.